In part one of Mindfulness and Skiing we have expert Dharma and meditation teacher Johann Robbins talk about how to enjoy your skiing experience more. In the beginning skiers are generally so excited that just being in the mountains brings peace and balance, but increasingly the modern busy mind (+technology) is intruding on this experience. Meditation is not the only tool to help bring your mind to the present, and allow you to feel life more fully, however I see meditation as increasingly important for Millennials and Gen Z, also known as the “anxious generation”. Note: Johann Robbins has been a wilderness guide and teacher of mindfulness meditation for decades. He has studied under Shinzen Young, Adyashanti, and Eric Kovig. This video series is a chance to apply the Insight/Vipassana tradition of meditation to skiing, or even hiking. The National Alliance on Mental Illness states that rising levels of anxiety is connected to technology and immediate rewards. This has an effect on natural longer-cycle reward systems (tasks that require more patience). Short cycle thinking is easy to witness skiing, it comes in the form of young people who can’t handle silence and must alter it with distraction in the form of music or chatting. Older generations can do the same through dragging neurotic mid-life crisis issues into the mountains, chatting about it as they ski or ride the lift. As Johann states in the video “I’ve spent a lot of time and money to bring myself into the mountains” and so why not fully enjoy the hours or days we are there, the other stuff will always be waiting for us when we get back. Native cultures often allow for maximizing your experience of nature by structuring it into religion or various forms of meditation. This is in contrast with the neurotic tourist mindset that invades popular parks around the country. It also is in contrast with traditional mountaineering (1850s-today) which objectify mountains into numbers and lists. – photo with Conner (Lakota Sioux) from Natives Outdoors on our latest trip to ski in Nebraska and South Dakota. In native cultures around the globe we saw they treated beautiful places in the wild with respect and often attached religious/spiritual modes of thinking to keep the humans in tune with what they are seeing. To objectify nature into numbers and more recently into social media stats is a Western way of thinking now adopted by most the world, and is linked to diminished happiness and depth of experience. Rates of depression, suicide and other mental illness is on the rise. Esteemed psychologist and successful global marketing wizard Dr. Clotaire Rapaille confirms that the one thing in common with all cultures in all parts of the world today is… the mobile phone. As the mobile phone is the primary provider of short cycle modern stimulous, we can see that the rise of mental illness globally is certain based on existing trends from long time adopters like the US, Germany and Japan. While mountain lists and Instagram may inspire you to get off your bum and have a good day in the mountains, the mindset of numbers will diminish the experience if they permiate the day and take you out of being present with your surroundings. The busy, chatty mind is a destructive force as it become so strong that people start carrying their stress into the mountains. The wild lands have traditionally been a place of escape from modern distractions, a place where you can reconnect with the roots of humanity. The urban “fiţos” visitors to the mountains may view the wilderness as a strange and hostile place, however it is the environment we’ve lived in for millions of years. Through backcountry skiing, hiking, hunting or other recreation we can reconnect and receive enormous comfort and mental health benefits. While we know from research on PTSD that nature can be very helpful, we also know that it is not the magic pill for the global rise in mental health problems. Johann talks about how nature can have amazing results, but is not helpful for deeper trauma. The “Risk Culture” of backcountry skiing is also mentioned in the video series. As we improve skiing we tend to look for the bigger, the badder, and the steeper terrain. This is a limited ride that ends as soon as we have lasting injuries or naturally age. For those of us who naturally gravitate into this path of skiing, we need to learn to enjoy the low angle pow as we age meditation can help with this. In the larger community of climbing we’ve seen the results of the hollow pursuit of chasing higher and higher grades. Depression and quitting the sport are common after one peaks. Those individuals forfeit a full lifetime of enjoyment in the sport because they can’t pull out of the competitive mindset that guided them for years. Johann’s tips in this 4 part series are useful for helping the modern mind get more out of each day, and assist with other things like risk management, and dealing with adverse conditions in the wild. Check out the first part which was released this March. The other four parts will be released over time. Parts 2-4 are in production now. 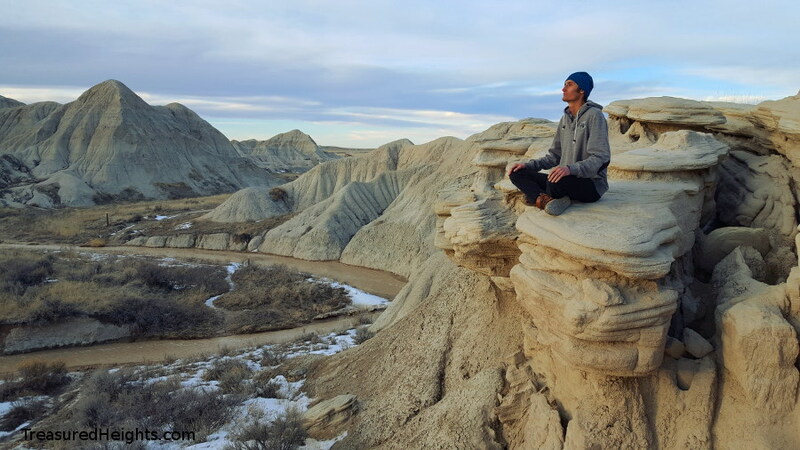 You can learn more about meditation through retreats and classes, Johann and other teachers offer programs at the Rocky Mountain Ecodharma Retreat Center. The Treasured Heights video channel on YouTube is a mix of stories about places, stories from the people I met who call those places home, and other content. The “other content” part of this includes issues surrounding backcountry skiing such as conservation, native land use, gear reviews and the most important part of your skiing machine – your mind.